NO FLIES ON US… From left, a great group of campers who were only too happy to spread the ‘No Flies On Us’ message, Tom Vincent, Cameron Sharp, Karly Vincent, Jenny Shief, Andrew Moore, Kathryn McCallum, Maria Wilson and Nathan Wilson. Photo: Supplied. THE Murray River is a hot spot for tourists during summer and this year is absolutely no exception. Together, Moira Shire and Campaspe Shire account for over 400kms of river frontage, which includes popular National Parks and State Forests. 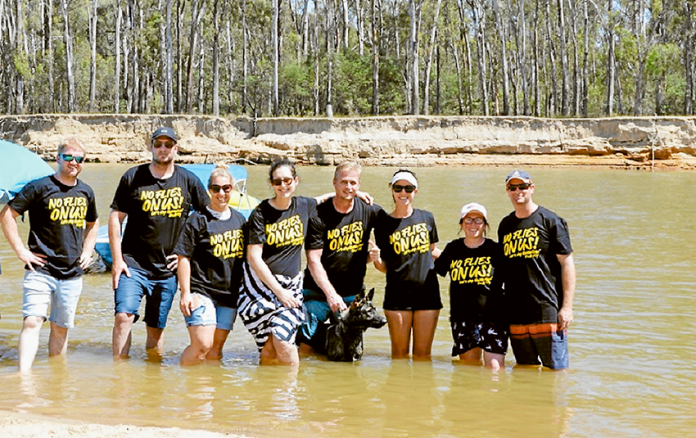 The region’s successful Queensland Fruit Fly community awareness and education campaign was extended this year to reach tourists visiting the area’s river banks and camping grounds and saw visitors get on board to support the ‘No Flies On Us’ message. Queensland Fruit Fly field officers braved the heat to distribute approximately 500 ‘No Flies On Us’ information packs to Murray River campers during the Christmas and New Year period. Goulburn Murray Valley Regional Fruit Fly coordinator, Ross Abberfield said the peak holiday season was the perfect time to reinforce the cause. “With tens of thousands of holiday-makers entering the area, we saw a real opportunity to create awareness about the threat that Queensland Fruit Fly poses to the Goulburn Murray Valley and surrounding regions,” Mr Abberfield said.